Over the past few years, Coachella has grown significantly as both a cultural event and as a music, beauty, and fashion trendsetter. As part of the POPSUGAR Insights Content, Commerce, and Culture study, we surveyed over 1,500 women between the ages of 18-44 and asked them to share their thoughts and opinions about this incredibly popular cultural event. 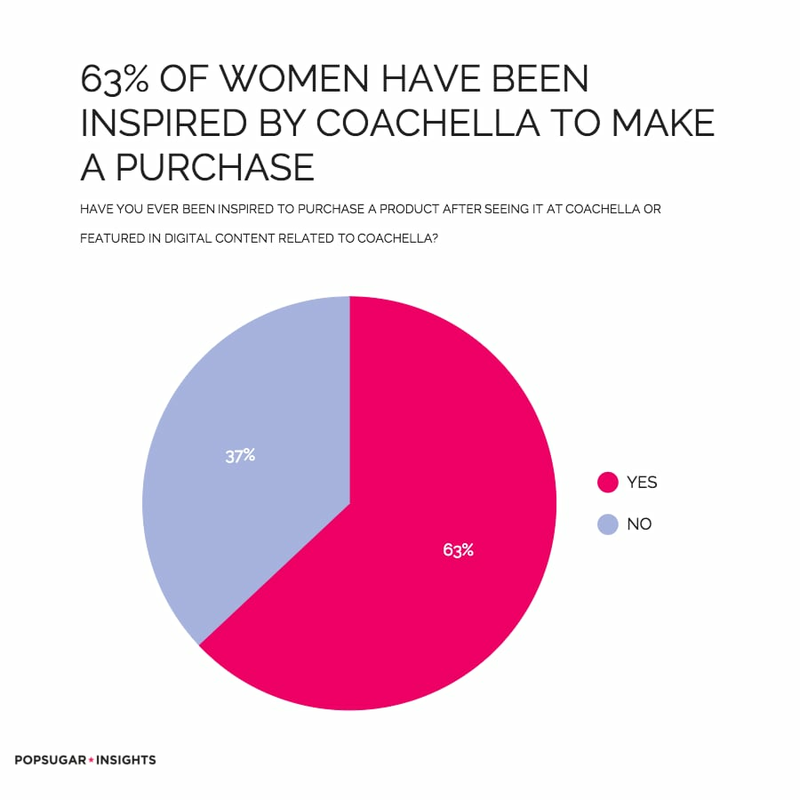 Overall, 68% of women said that they've consumed digital content related to Coachella. When asked what aspects of Coachella they find particularly influential, music ranks first overall (70%), followed by fashion (27%) and beauty (3%). This influence extends from content to commerce, as 63% of women said that they've been inspired to purchase a product after either seeing it featured at Coachella or in digital content related to Coachella. In terms of specific platforms that women use to connect to digital content related to Coachella, women use social platforms like Facebook (58%), YouTube (51%), and Instagram (35%), as well as websites and mobile apps from digital publishers (35%). Women view Coachella as a "place to see great artists, musical acts, and performances" (46%), a "musical event they would like to attend in the future" (43%), and a "place to learn about new musical acts or genres" (39%). In general, 37% of women view it as "a music festival that I love reading about or watching online", and the same amount see it as "a place to see what is cool or trendy in popular culture". Thirty-two percent believe Coachella is "an important cultural event" and 21% say it's a "place to show off my personal fashion".